Ralph Berlin began his career with the Steelers one year before Chuck Noll was hired. 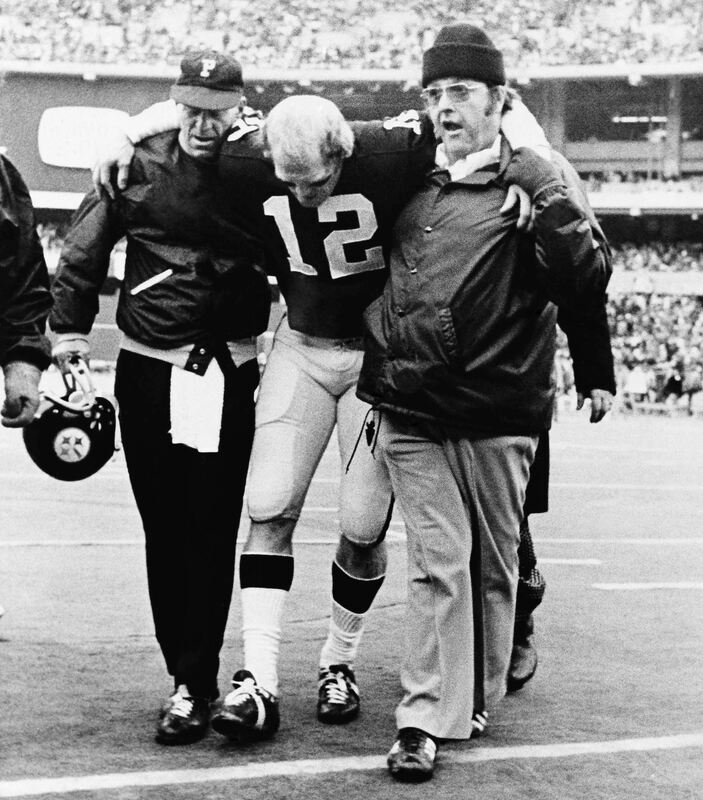 From that moment on, Steelers trainer Ralph Berlin was known affectionately as The Plumber. It was Art Rooney Jr who first met Berlin on a scouting trip. Berlin was working as trainer at the University of Kentucky and, in those days, when scouting was more casual, Art Jr had a long conversation with Berlin about prospects at Kentucky and elsewhere. They struck up a friendship. When the Steelers had an opening for a trainer several years later, Art Jr got him an interview with Dan Rooney, who did the hiring. Berlin, a former Marine with a wicked sense of humor, was a good fit, but not until Arthur J. Rooney, Sr. laid down the law to him. Berlin was not complete without his cigar, but his income and family obligations limited him to the lower priced brands, namely Hav-A-Tampa cigars. “If you are going to work for this organization,” the Chief informed him, “you better smoke better cigars.” Berlin gladly complied. Berlin was officially Head Trainer for the Pittsburgh Steelers for twenty-three years, but that doesn’t even begin to describe all that he did and what he meant to the organization. The guy who put in long hours, taped ankles and worked with the team doctors to keep the guys on the field – or get the injured ones back on the field – also worked part time as a scout. Not a bad find, but, said Berlin, “we didn’t think he was ever going to be the player he turned out to be.” Guess not. That’s why they waited till Round Two to draft him. The Steelers put Berlin on a plane to Philadelphia the day after the 1974 player draft, with orders to sign Temple Undrafted Free Agent Tight End Randy Grossman. It was believed the Eagles were going to try to sign Grossman, so Berlin took the first flight out to get there first. Grossman mistakenly thought Ralph was the team owner. Berlin, eyeing Grossman out of uniform, was unimpressed. He went in another room and called Rooney. “Dan, he’s scarcely bigger than I am,” he whispered. He was told to sign him anyway. He did. Grossman now owns four Super Bowl rings. Of all the Ralph Berlin stories, perhaps the most remarkable was the Ralph and Mad Dog Show at Super Bowl IX, played January 12, 1975 at Tulane Stadium in New Orleans. Days before the game, Dwight White – Mad Dog – was sicker than a dog. Myron Cope – in his book Double Yoi – recalled that the New Orleans Saints’ team doctor diagnosed White with,” severe pneumonia, complicated by pleurisy, a lung infection,” and ordered him hospitalized. Two days later, Sunday morning, the day of the game, Ralph’s phone rang. It was White. “Come get me,” White ordered. The Plumber got they okay from the team doctor, drove to the hospital, and took White from his hospital bed to the team’s hotel for the pre-game meal. White managed to eat a little bit, but still looked awful. He’d lost a lot of weight. No one knew how much. When they arrived at the Stadium, Berlin taped White’s ankles and helped him with his uniform. The temperature was in the 40’s and it was cold and damp, and White was determined to go out and warm up with his teammates. The Saints’ doctor thought it was too risky, but the Steelers team doctor overruled him, reasoning that White would probably pass out during warmups or simply realize on his own that he was too sick to play. Noll figured White was good for one series before he would pass out. But White not only made it through warm-ups, he played the entire first half, downing Minnesota Vikings Quarterback Fran Tarkenton in the end zone for the first score of the game, and anchoring the greatest team defensive performance in Super Bowl history. He sat out only two plays the entire game, though he later admitted he couldn’t remember much of the game because it was such a blur. It turned out he had lost 18 pounds in the hospital. For more than twenty years, Berlin and Noll met every week with the team doctor, to discuss injuries, who could play, and who could not. Berlin’s efforts to keep his guys on the field were recognized by Jack Lambert, who, in his Hall of Fame Acceptance Speech, marveled at how fortunate he was to be associated with the entire organization. “The front office, the coaching staff, the medical staff — Dr. Best, Dr. Huber, Dr. Steele, the trainers headed by Ralph Berlin and Ralph Miley — who did their best to stitch me up and piece me together for 11 years. And the most important people in the organization: the locker room and equipment men, Jackie Hart, Tony Parisi, Rodgers Freyvogel, Frankie and Mike. You may not recognize all those names above, but to Lambert, they were family. And that’s why they are included. He also played a prank on the rookies several years, putting up a sheet of paper to have them sign up for free Thanksgiving turkeys. There were no turkeys, of course, but the rooks were sent on wild goose – or turkey – chases to find them. One year, in a switch on the old prank, Franco and Lynn Swann actually did bring in cooked turkeys and put them in the rookies’ lockers. Terry Long ate his hot turkey right in the locker room. Ralph Berlin retired in 1992, after 23 years as Trainer, to spend more time with family, but he remained part of the Steeler family. Every year, he’d attend the NFL Player Combine at Indianapolis, and he would also help Trainer John Norwig get through the rush of pre-season physical exams. He was at Indy just this past February. In his 2012 interview with Pittsburgh Sports Daily Bulletin, the Plumber was asked if he had any final thoughts for readers or fans. His answer was especially instructive. Ralph Berlin, who spent 48 years with the organization, was part of that stability, He was key part of an extended family that truly loved him and will miss his loyalty, his ability, his dedication, his cigar, and his razor sharp tongue. He is survived by his wife of 56 years, Dee Berlin, his son and daughter, eight grandchildren, the Rooney family and organization, hundreds of former players, and Steeler Nation. Together we mourn and celebrate his life. I was wondering where Rebecca gets all this in depth, historical information… then I saw the byline and all was made clear. Nice work Homer. Thank you. Great write-up, I had never heard of “the plumber”, thank you, Homer J. Once again you educate the masses. Thanks Homer.